Drawing of Self trimming lamp in Ahmad ibn Mūsā ibn Shākir's treatise on mechanical devices. The manuscript was written in Arabic. The Book of Ingenious Devices (Arabic: كتاب الحيل Kitab al-Hiyal, Persian: كتاب ترفندها Ketab tarfandha, literally: "The Book of Tricks") was a large illustrated work on mechanical devices, including automata, published in 850 by the three brothers of Persian descent, known as the Banu Musa (Ahmad, Muhammad and Hasan bin Musa ibn Shakir) working at the House of Wisdom (Bayt al-Hikma) in Baghdad, Iraq, under the Abbasid Caliphate. The book described about one hundred devices and how to use them. The book was commissioned by the Abbasid Caliph of Baghdad, also made by Al-Jazari, Abu Jafar al-Ma'mun ibn Harun (786–833), who instructed the Banu Musa to acquire all of the Hellenistic texts that had been preserved by monasteries[specify] and by scholars[who?] during the decline and fall of Roman civilization. [clarification needed] The Banū Mūsā brothers invented a number of automata (automatic machines) and mechanical devices, and they described a hundred such devices in their Book of Ingenious Devices. Some of the devices described in the Book of Ingenious Devices were inspired by the works of Hero of Alexandria and Philo of Byzantium, as well as ancient Persian, Chinese and Indian engineering. Many of the other devices described in the book, however, were original inventions by the Banu Musa brothers. While they took Greek works as a starting point, the Banu Musa went "well beyond anything achieved by Hero or Philo." Their preoccupation with automatic controls distinguishes them from their Greek predecessors, including the Banu Musa's "use of self-operating valves, timing devices, delay systems and other concepts of great ingenuity." Many of their innovations involved subtle combinations of pneumatics and aerostatics. The closest modern parallel to their work lies in control engineering and pneumatic instrumentation. In turn, the Banu Musa's work was later cited as an influence on the work of Al-Jazari, who produced a similarly titled book in 1206. 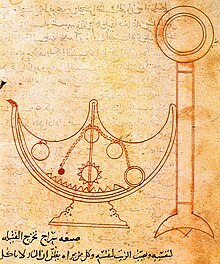 Given that the Book of Ingenious Devices was widely circulated across the Muslim world, some of its ideas may have also reached Europe through Islamic Spain, such as the use of automatic controls in later European machines or the use of conical valves in the work of Leonardo da Vinci. The trick vessels have a variety of different effects. For example, a single outlet pipe in a vessel might pour out first wine, then water and finally a mixture of the two. Although it cannot be claimed that the results are important, the means by which they were obtained are of great significance for the history of engineering. The Banu Musa were masters in the exploitation of small variations in aerostatic and hydrostatic pressures and in using conical valves as "in-line" components in flow systems, the first known use of conical valves as automatic controllers. In several of these vessels, one can withdraw small quantities of liquid repeatedly, but if one withdraws a large quantity, no further extractions are possible. In modern terms, one would call the method used to achieve this result a fail-safe system. The non-manual crank appears in several of the hydraulic devices described by the Banū Mūsā brothers in their Book of Ingenious Devices. These automatically operated cranks appear in several devices, two of which contain an action which approximates to that of a crankshaft, anticipating Al-Jazari's invention by several centuries and its first appearance in Europe by over five centuries. However, the automatic crank described by the Banu Musa would not have allowed a full rotation, but only a small modification was required to convert it to a crankshaft. The double-concentric siphon and the funnel with bent end for pouring in different liquids, neither of which appear in any earlier Greek works, were also original inventions by the Banu Musa brothers. Some of the other mechanisms they described include a float chamber and an early differential pressure sensor. The book describes the construction of various automatic fountains, an aspect that was largely neglected in earlier Greek treatises on technology. In one of these fountains, the "water issues from the fountainhead in the shape of a shield, or like a lily-of-the-valley," i.e. "the shapes are discharged alternately—either a sheet of water concave downwards, or a spray." Another fountain "discharges a shield or a single jet," while a variation of this features double-action alternation, i.e. has two fountainheads, with one discharging a single jet and the other a shield, and the two alternating repeatedly. Another variation features one main fountainhead and two or more subsidiary ones, such that when the main one ejects a single jet, the subsidiaries eject shields, with the two alternating. The Banu Musa brothers also described the earliest known wind-powered fountain, which is described as, "operated by wind or water, it discharges a single jet or a lily-of-the-valley." A variation of this fountain incorporates a worm-and-pinion gear, while another variation features double-action alternation. The book also describes a fountain with variable discharge. The book also describes fountains that change shapes at intervals. The Banu Musa invented an early mechanical musical instrument, in this case a hydropowered organ which played interchangeable cylinders automatically. According to Charles B. Fowler, this "cylinder with raised pins on the surface remained the basic device to produce and reproduce music mechanically until the second half of the nineteenth century." The Banu Musa also invented an automatic flute player which may have been the first programmable machine. The flute sounds were produced through hot steam and the user could adjust the device to various patterns so that they could get various sounds from it. The mechanical grab, specifically the clamshell grab, is an original invention by the Banu Musa brothers that does not appear in any earlier Greek works. The grab they described was used to extract objects from underwater, and recover objects from the beds of streams. The Banu Musa also invented an early gas mask, for protecting workers in polluted wells. They also described bellows that could remove foul air from wells. They explained that these instruments allow a worker to "descend into any well he wishes for a while and he will not fear it, nor will it harm him, if God wills may he be exalted." The book describes a dispenser for hot and cold water, where the two outlets alternate, one discharging cold water and the other hot, then vice versa repeatedly. It also describes a vessel with a basin by its side where, when cold water is poured into the top of the vessel, it discharges from the mouth of a figure into the basin; when hot water or another liquid is poured into the basin, the same quantity of cold water is discharged from the mouth of the figure. The book also describes a boiler with a tap to access hot water. The water is heated through cold water being poured into a pipe which leads to a tank at the bottom of the boiler, where the water is heated with fire. A person can then access hot water from the boiler through a tap. ^ Bennison, Amira K. (2009). The great caliphs : the golden age of the 'Abbasid Empire. New Haven: Yale University Press. p. 187. ISBN 978-0-300-15227-2. Another important Persian lineage descended from an astronomer were the three Banu Musa brothers, Muhammad, Ahmad and Hasan, who hailed from the northeastern province of Khurasan. ^ Dimarogonas, 2000, p. 15. ^ Rosheim, 1994, p. 9. ^ a b c Otto Mayr (1970). The Origins of Feedback Control, MIT Press. ^ Koetsier, Teun (2001), "On the prehistory of programmable machines: musical automata, looms, calculators", Mechanism and Machine Theory, Elsevier, 36 (5): 589–603, doi:10.1016/S0094-114X(01)00005-2.